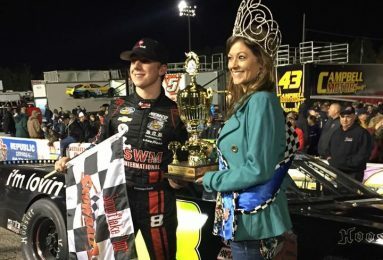 Avenging a sour Friday at Five Flags Speedway, reigning Snowball Derby champion John Hunter Nemechek took the Pro Late Model field to school under the lights on Saturday night. Nemechek dominated the Allen Turner Hyundai Snowflake 100, leading all but six laps and surviving a brief scrap with polesitter Justin South just past the race’s one-quarter mark before pulling away down the stretch to secure the checkered flag. The win, the 18-year-old’s first in the Saturday classic, came after finishing a bitter second to Bubba Pollard in 2014 and then being disqualified in Friday night’s post-qualifying inspection for the Snowball Derby. While he will start 37th in his quest to repeat on Sunday, the second-generation star and current NASCAR NEXT class member says that the momentum the Snowflake win gives him has bolstered his confidence about being able to fight through and sweep the weekend. Nemechek took the lead off the start from South, and held it through a bevy of early caution flags that slowed the pace. The night’s first caution turned into a messy red flag period, with nearly 10 cars getting stacked up and torn to shreds in turn four. Among those involved: Derek Thorn, Spencer Davis, Brad Mays, Ronnie Osmer, Scott Hantz, Anthony Cataldi and Riley Thornton in a mess that took a half hour to clean up and sort out before the green flag returned. Two more cautions, at lap 17 for a spinning Scott Hantz and at lap 23 when Josh Williams looped his machine exiting turn four, would fly before South was able to outsmart Nemechek on a restart and assume command of the field from laps 24 through 29. A tap from Dalton Armstrong that sent Hunter Robbins around, however, would allow Nemechek to return the favor to South on the next green flag, and from there, he would never look back — leading the final 71 laps en route to the victory. Three more slowdowns prior to lap 39, including two red flag periods (for windshield cleanup on lap 34 and a pit road medical emergency on lap 39), would continue the jerky rhythm of the race; but once the field resumed after the final stoppage, the final 61 laps ran from green to checkered. Three-time Snowflake 100 champion Chase Elliott chased Nemechek all the way to the finish, but could only get within 1.862 seconds of the No. 8 McDonalds entry at the final flag. 2015 Show Me the Money Series champion Bret Holmes, Kenzie Ruston and Cole Anderson rounded out the top five, with defending race winner Bubba Pollard coming home in sixth. The 48th annual Snowball Derby weekend concludes on Sunday at 3 p.m. ET/2 p.m. CT, when the Derby goes green for 300 laps to determine the country’s grittiest super late model driver. New track record holder Ty Majeski will lead the field to the green flag. For more information, visit www.5flagsspeedway.com. The 21-year-old is currently studying Broadcast Journalism at Winthrop University in Rock Hill, S.C., and is also serving as the full-time tour announcer for both the United Sprint Car Series and the Must See Racing Sprint Car Series.